Did you know that the second line of the PDF is a set of characters to make sure PDF files are treated as binary objects? This is one of the many things I learnt while reading the Early Access release of Developing with PDF By Leonard Rosenthol. The PDF file format can be hard to work with because it is complex, very different from many other file formats and there is not a huge amount of documentation. There is the definitive ISO 32000 specification, but it is a hard read and is a specification rather than guide. On several occasions, I have found I only really understand the specification once I have solved the problem…. Nobody is better qualified from a technical viewpoint to write a book to fill this gap. Leonard is a Principal Scientist and PDF Architect for Adobe and has over 15 years experience working with PDF (both inside and outside Adobe). He is involved in the ISO committee for PDF. I have met him at conferences, and he is also a really nice guy with a great sense of humour. He brings both his knowledge and his humour to the topic in this book. It is much easier to read than the PDF specification and clearly explains how the PDF file format is structured before moving into clear sections on Images, text and shapes. In each section he also gives you some background into how the format has evolved and which values can ignore. If you are a beginner it will get you up to speed and even if you have a detailed knowledge, it will help you to improve. My favourite section was on Marked Content, which I think is much clearer and better than the Specification. The Annotations and Forms sections are also very good and really get to grips with the different types, although I felt a couple of the examples were slightly too long. This is the early access edition, so some of the sections are not yet written and indeed Leonard is asking for feedback on what people would like to see. I am very much looking forward to the chapter on Transparency (as I feel it could be much better explained than in the PDF file specification). 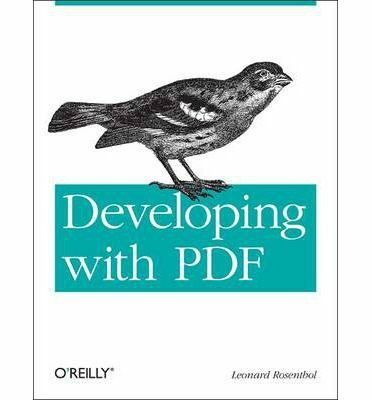 As a PDF developer, I would thoroughly recommend this book to anyone working with PDF. It is well-written, easy to read and packed with information. And you have the chance to influence what else will go into it. You can find out more from the publisher, O’Reilly, here. Whats your favourite book on PDF’s? Is there a book you think we should check out regarding Java, PDF or HTML5, just let us know. This article is part of our ‘Book Review’ Series of articles in which we review interesting books. I’ve been looking for a book like this. Thanks for sharing it. Some of the sections are still to be written so you should let Leonard know what you think should be added. I read PDF Explained by John Whitington when I started to learn the format. It’s a great book for beginners; much better than diving into the format specs. It won’t help you become an expert in PDF, but you’ll probably understand the file structure. In fact, after reading that book I created a syntax coloring guide for PDFs for my favorite text editor. That said, I’m looking forward to Rosenthol’s book to further my understanding of PDF. Color highlighting should make the raw PDF much easier to read. Which text editor did you add it to? It is for JG Soft’s EditPad Pro. I have used it to help troubleshoot a few PDFs in my work. It does make a big difference when reading the raw PDF!